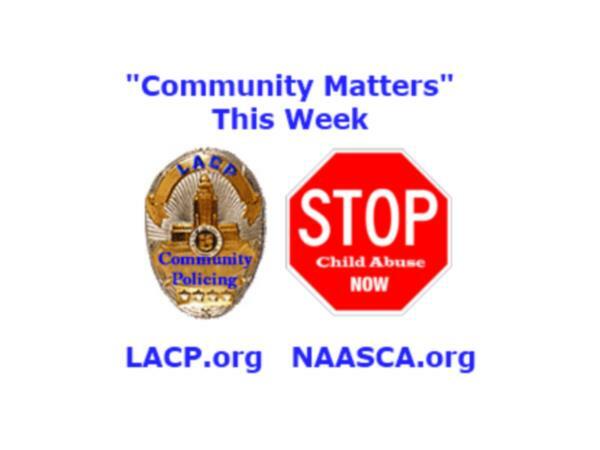 News Of The Week Show ~~ Please click on both these links to see our "News of the Week" for September - Week 2 from: LACP.org and NAASCA.org ~~ Join our founder and host, Bill Murray, co-hosts MJ Goyings, Carol D. Levine and other LACP & NAASCA family members, as they invite you to help them discuss the public safety and child abuse related news and crime stories of the week from each of our two national sister efforts, LA Community Policing and the National Association of Adult Survivors of Child Abuse. Every day we carry new articles based on current events on both our web sites. Look for them daily in the lower gray portion of our home pages. To make things easy, we collect them all together for this, our two hour long Sunday show .. where community call-in participation is always welcome!